At this time, the city of Houston is experiencing a shortage of recycling outlets that will accept Single Stream Recycling (mixing glass, plastics and cardboard) from commercial entities. However, we do offer a full commercial recycling service for OCC (Old Corrugated Cardboard) Products. 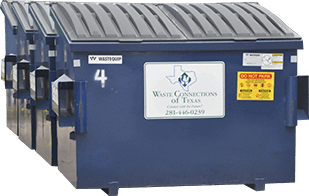 Waste Connections of Texas can provide 2,3,4,6,8 cubic yard commercial container for your OCC collection needs.